The book has laughter, wit, pathos, spirituality, anger - in a nutshell, it attempts to capture comprehensively almost all emotions and facets of human existence and to provide solace and support for each with an appropriate quotation, taken from the mouths of our path finders, seers and servants. Gems of knowledge are 'Pearls of Wisdom'. 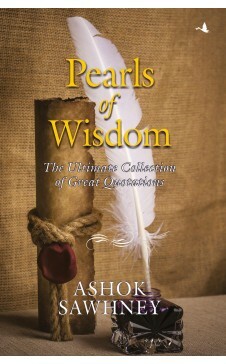 these pearls come in the form of quotes, which are inspirational writings by the world's greatest thinkers. These quotations enlighten our minds and enthuse our hearts. They are the essence of what the wisest men of the world have said and are packed with wisdom and experience of ages. This wisdom and experiences can be preserved through quotations. The quotes and proverbs in this book reflect the experiences of our lives. To inspire means to infuse with life. Such inspiring quotes by the world's most prominent thinkers, do influence our thinking, arouse us from our dampened spirits, and enliven our sensitivity to the meaning of our lives. Such motivational ideas and quotes also exalt us by strengthening our hearts and resorting confidence in our souls. PEARLS OF WISDOM is a logical English corollary. Its a masterly collection of utterances of famous persons and proverbs on topics touching our day to day life. Its a book one keeps on one;s bedside for reference. Ashok Sawhney, a leading name in the Indian watch-making industry, has other remarkable qualities apart from entrepreneurship: he us a multi linguist and writes excellent Urdu poetry. A veteran industrialist, Ashok established his first wrist-watch manufacturing unit in India in 1970, after gaining valuable experience at the Langendorf Watch Company in Switzerland. As a true nationalist, his objective was to reduce dependence on imports. Today, his five watch-making units employ over 2000 people. Ashok is Global President of Swiss Military, the luxury retail brand from Switzerland, which sells its products in 15 countries worldwide, He was awarded the 'Udyog Patra Samman' by the Institute of Trade and Industrial Development in 2002. Ashok is fluent in seven languages. His Urdu poetry is highly acclaimed and has found patrons in contemporary Urdu poets and prominent Muslim universities alike. He is the author of Surbhi Suman, which is a collection of classic Urdu poetry and Kya, Kyun, Kaise? - a compilation of question and answers on commonly observed Indian customs. In 2016, the World Business Conclave Hong Kong bestowed Ashok Sawhney with the prestigious 'GLOBE Platinum Award' for 'Leader Par Excellence' while his brand Swiss Military was awarded the 'Best Upcoming Brand in Asia' amongst 101 brands nominated.